The main base from which you begin your exploration of the Nexus 7 is the Home screen. It’s the first thing you see after unlocking the tablet, and it’s the place you go to whenever you quit an app. Status icons: These icons represent the Nexus 7’s current condition, such as its battery status or Wi-Fi network signal strength or whether an alarm is set or Bluetooth is active, for example. Widgets: A widget is a teensy program that can display information, let you control the tablet, access features, or do something purely amusing. 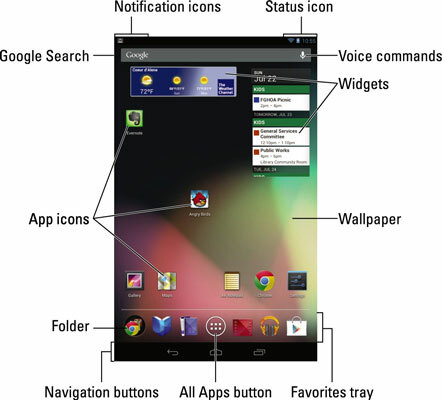 App icons: These little pictures represent the apps (applications) installed on your tablet. They’re stuck on the Home screen for convenient access. Touching an app icon opens, or runs, the app. Wallpaper: The background image you see on the Home screen is the wallpaper. All Apps button: Near the bottom center of the Home screen is the All Apps button. Touching this button displays the All Apps screen, which lists all apps installed on your Nexus 7. Favorites Tray: The lineup of icons near the bottom of the screen contains six slots for popular apps. They can appear singularly or in folders and explains how to add or remove apps from the Favorites bar as well as how to create folders. Navigation buttons: Special symbols are found on three corners of the Home screen as well as in quite a few apps. The symbols identify buttons you touch to activate common Nexus 7 features. The Home screen is entirely customizable. You can add and remove icons from the Home screen, add widgets, build app folders, and even change wallpaper (background) images. Touching a part of the Home screen that doesn’t feature an icon or a control does nothing. That is, unless you’re using the live wallpaper feature. In that case, touching the screen changes the wallpaper in some way, depending on the wallpaper that’s selected.